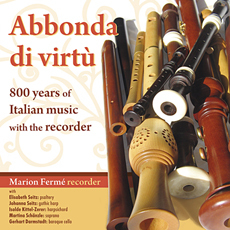 This recording is a journey through the Italian musical countryside, inviting the listener to discover a both ancient and modern instrument – the recorder. The various different recorders can be heard not only as a solo instrument, but also together with other instrumental and vocal instrumentations. This allows the listener to enjoy a world full of richness and get to know a broad repertoire. Italian composers, both well known and those yet to be discovered, are presented. The running theme of this programme taking us through 800 years of musical history is the virtuosity of the pieces – and the attempt at copying the perpetual aesthetic ideal: the human voice. These two elements are fundamental to Italian music.